Looking for a salty, crunchy snack? Pass those greasy potato chips by, and try a handful of Cajun barbeque pumpkin seeds instead! Pumpkin seeds (or “pepitas”) are high in protein, fiber, and potassium. They’re also fun to eat! I love the tangy zip that these little treats pack, and if you like things spicy you can add a dash or two of cayenne pepper. This is an easy recipe I found at The Daily Meal, it’s ready in under 20 minutes and you don’t need many ingredients to make it. All you need is an organic, cage-free egg white, organic Cajun seasoning (here’s a good one), some BBQ sauce, sea salt and pepper if you’d like, and or course organic pumpkin seeds. You might want to make a double batch…these are just a bit addictive and they go fast! Start by whipping the egg white. Then, add the spices and BBQ sauce. Toss the pumpkin seeds into the mixture and stir until all the seeds are coated with egg and spices. Then, just line a baking pan with parchment paper and lay the seeds out in a single layer. Bake them for 10-12 minutes, until they start to brown a tiny bit and the egg mixture is dry. Then, let them cool and break them apart. You’re ready to enjoy some delicious, savory seeds! These pumpkin seeds are wonderful on a salad. They add a bit of flavor and crunch, without the empty calories and carbs of croutons. Separate the egg white and yolk. Whip the egg white until frothy. 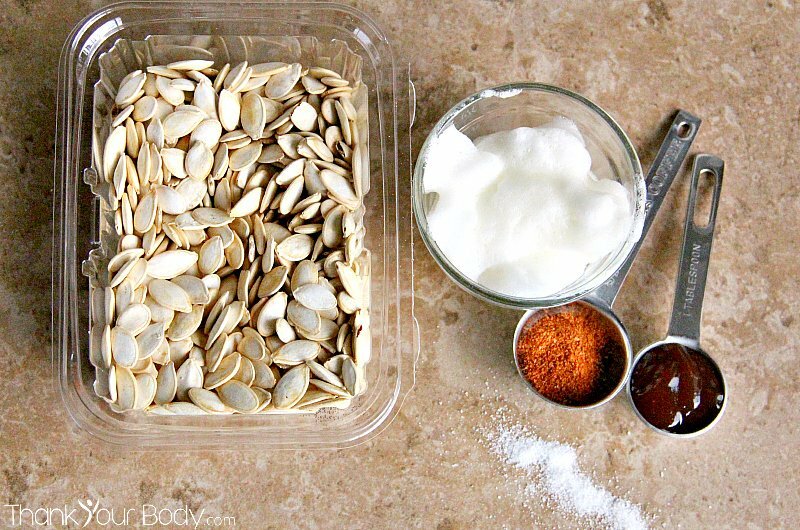 Put the pumpkin seeds in a bowl, and add the egg white, Cajun seasoning, BBQ sauce, pepper and salt. Mix well until all the ingredients are blended and all of the pumpkin seeds are evenly coated. Line a baking sheet with parchment paper. Put the seeds on the paper and flatten with the back of a rubber spatula or spoon until they form a single layer. Bake the seeds for 10-12 minutes, until they're dry. Allow the seeds to cool, then break them apart and store them in an airtight container.